Here are another couple of images from a recent trip to the Parker River National Wildlife Refuge. There was a very low tide that morning, which left behind some wonderful textures in the sand as it pulled out. The low angle of the sun just after sunrise was perfect for capturing the bright blue colors of the morning sky in the wet sand, and there were also some opportunities to capture some reflections of the birds as well. The shorebirds were taking advantage of all of the exposed sediments, and were pulling small prey from below the surface with ease. It is amazing to me how much life there is just below the sand, since huge flocks of these birds will scour the area during every low tide. It was also really interesting to see them pull small clams from the sand, and then swallow them whole. Sometimes they would even rinse it in a puddle before eating it. 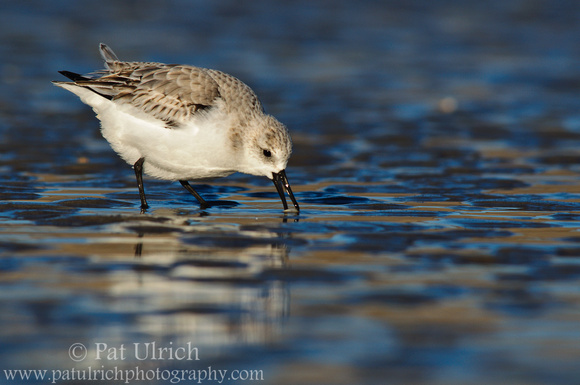 View more photos of sanderlings in my Sandpipers Gallery. This post was submitted to the World Bird Wednesday blog meme -- follow the link to check out this week's posts. Amazing images, beautiful, sharp and clear. Good pictures, specially the first one! The details in those photos are stunning! Hmm, whole clams...delicious. gorgeous angle across the water! makes the photos! Lovely images to see of these beautiful birds. Grand close up of these gems!! Boom & Gary of the Vermilon River, Canada. Excellent shots Pat. Lovely little birds of the seashore. Great photos. Early morning is also my favorite time to photograph birds. Beautiful colors in the water. Awesome shots, Pat! Wonderful color and detail. Reminds me I'll have to make a trip out there. One of my favorite areas to visit. 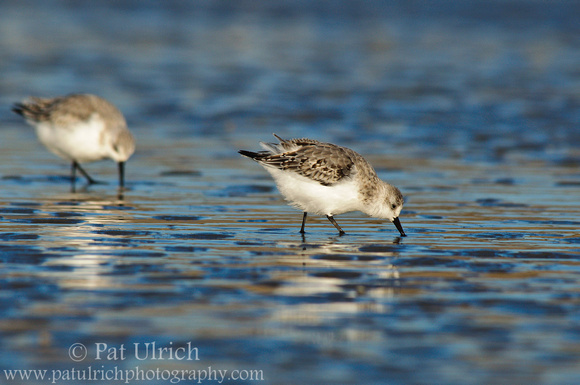 Gorgeous shots of the sanderlings, Pat! Awesome! Classic Ulrich. The water is as beautiful as the birds! Exquisite images! The color, detail and clarity in each photograph is absolutely superb! It's always a joy to watch these tiny birds feed along the shoreline. Thanks, Martha! I have a pretty high bar when it comes to sharpness and clarity in the photos I'll share. Thanks, Modesto! It was a lot of fun photographing these guys in this setting. Thanks, Jedediah! I thought it was really interesting that they swallowed the whole shell right down. Thanks, TexWisGirl! The electric blue reflection of the morning sky really does stand out. Thanks, Andrew! I was definitely down and dirty for these -- there's no other way to photograph them in my book! Unfortunately, this morning was below 40 degrees, so it was rather chilly to get wet in the sand. Worth it though! Thanks, Gary! It's always a pleasure to get close to birds like this! Thanks, Holdingmoments! They are a delight to watch for sure! Thanks, Mick! Nothing beats photography at sunrise for me! Thanks, Hilke! 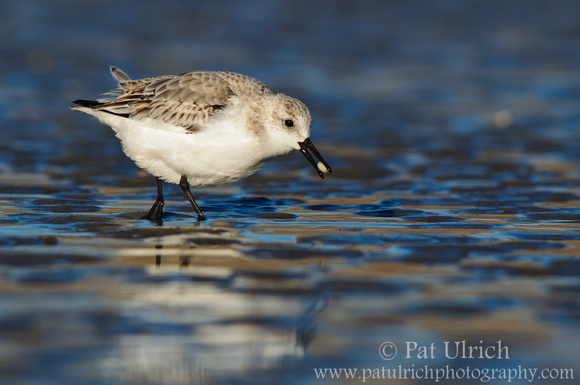 Parker River is a remarkable place -- I was there again today, and found another fun flock of shorebirds to photograph. Thanks, heyBJK! Glad you enjoyed them! Lol, John! I'm happy to have found some of my favorite subjects to shoot here! Thanks, Springman! I agree -- they look great on that bright blue setting. Thanks, Julie! I always have fun watching them -- especially when they chase the waves! Hi Pat, enjoyed your blog, lot of nice work here. I don't know if I've said this before, but it sure must be nice to get out of the fog. No more silver water! Haha. Loving the peak of action shots showing behavior and how they are isolated in the water. Not sand as you expect in most situations. A side note I saw your moose photo that loads on your main website with links to all your info and the blog and I photographed the same guy! I get a real kick out of it. He had such a rack on him didn't he? Was he any friendlier for you? As soon as I got my chance to photograph him he took one peek at me and started to walk off on his own path. All the best pat and thanks for the comments! Wonderfully clear and sharp images of these pretty birds feeding. Love the look of the water as well. Pat, just perfectly captured! I love that place! Hi there - Could tell it was one of your from the thumbnail! Stunning. Gorgeous captures! Beautiful light and reflections. Thanks Dominic! Sunrise light is my favorite to shoot in for sure! Thanks, Ross -- glad you enjoyed looking around! Thanks, Jarred! I did grow to love the fog in the Bay Area for a variety of reasons, but having a bit more color in the wet sand reflections is definitely nice! As for the moose, I had some great encounters with friendly moose in Grand Teton. The male that turns up in my slideshow was quite relaxed and we were able to observe him for a while. However, the large bull that I posted to the blog a few days ago gave us only a few minutes by the road before he disappeared into the forest. Thanks, Kathie! Parker River NWR has quickly become a favorite location of mine! Thanks, Stewart! As Springman noted above this is my classic style. Pat, You always have outstanding images to share. Oh my goodness, your pictures are simply stunning! Love love love them! Stunningly crisp shots of these gorgeous Sanderlings Pat! I love that early morning light and that beautiful blue and gray bokeh.